The Elliotts Winter Workwear range has been designed to include the best safety features in work wear that is designed to protect you from the cold and wet winter elements. The Z40, Flying Jackets, Eureka and Crest Jackets are all now certified by SAI Global to AS/NZS 4602:1999 High Visibility Safety Garments. This independent 3rd party certification provides that additional assurance that you are buying a quality product. "Being a manufacturer of high visibility clothing and not just an importer we take care to ensure our products are of the highest quality and do what they are designed to do. Having our high visibility garments certified in our Australia, China and Fiji factories is our commitment to people who wear our brand and rely on it to protect them from harm" Anthony Elliott, Managing Director. 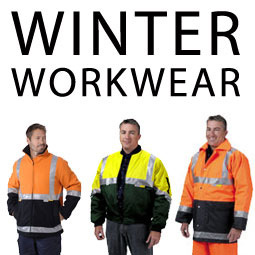 Elliotts Winter range incorporates high visibility safety garments that have been designed to be worn by people in situations where they may be exposed to hazards from moving traffic or from moving plant and equipment. The range includes apparel suitable for daytime use, night-time use or for wear under both day and night-time conditions where the wearer will be seen by reflected light. The Z40 jacket is the ultimate multipurpose jacket designed for all working environments. The Z40 Jacket comes with removable padded quilted sleeves, Class D/N high visibility vest, ZETEL XR high visibility waterproof Jacket with windproof oxford material, seams fully seam sealed with Interchangeable Lining System (BLUE) - this garment includes a removable zip out liner. The liner has removable sleeves and is compliant to Class D/N and is reversible. The Flying Jacket is a high visibility two-toned bomber style jacket with a padded quilted liner, concealed hood, zip front, ribbing base, cuffs and collar, pen and mobile phone pocket on arm, hand warmer pockets and one inside each pocket. Available in day and day night versions in various high visibility colours. The Eureka Jacket is a high visibility full wool jacket with 3M reflective trim available in Yellow/Black and Orange Black. Made from 90% wool/ 10% polyester material, zip front with high collar and hand warmer pockets. The CREST soft shell winter jacket is a light weight, wind proof and highly water resistant jacket. The jacket is made from black polyester soft shell which incorporates a waterproof, windproof and breathable membrane. Zip front with high collar, chest mobile phone/radio pocket and hand warmer pockets. The CREST jacket is available in Black, Orange/Navy and Yellow/Navy with reflective trim.